This two day course is designed to give you a full introduction to the tools and methods of basic jewellery making. 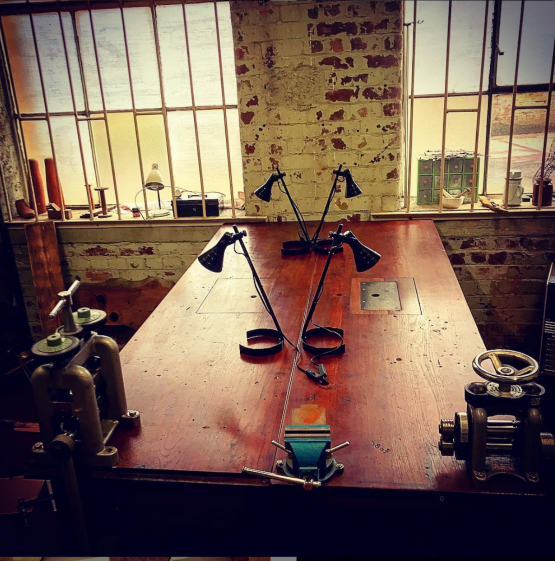 With a class of just four students, in his new, fully equipped studio, Karl will guide you through the process of how to cut, file, shape and solder copper and silver, in order to create your own special piece (or pieces) of jewellery. These intimate classes are designed to encourage participants to think about the way different materials work and how various methods such as heating, hammering and texturing, can assist in creating your final unique piece. The aim is for each student to leave the course with a wearable piece of jewellery that they can proudly say they have made themselves. Working from either your own design ideas or a number of possible examples, Karl will work closely with you with to create it, within the parameters of both the timescales and materials available. Together, you will examine the designs, and explore the methods required to turn your design into a reality. A set amount of materials are included in the price, however if your design requires more, this can be purchased on the day. The course will run each day between 10am and 5pm with a one hour break at 1pm. All tools required will be provided, however if you do have any personal tools you are more than welcome to bring them along. Refreshments will be provided throughout the day but students are asked to bring a packed lunch. If you have any questions regarding Karl’s workshops, please do not hesitate to contact us.